It’s a familiar story, but bear with us: A stranger comes up to you with a button. “Push it, and two things will happen,” they say. “You’ll receive all the money you could ever want, and someone you don’t know will die.” In response, you hem and haw. You wax morality at the price of a human life. And, in the end, you make a choice. Push or don’t, that choice feels meaningful. It feels like a reflection of what you value and who you are. Suddenly, time rewinds and the stranger walks up to you again. And again, and again, until you make the opposite choice. Regardless of your wishes, you’re trapped in this grim situation until you’ve explored both ways it could possibly play out. That’s the world posited by Zero Time Dilemma, the third game in the cult favorite Zero Escape series. It’s a bleak universe, not because the things that happen in it are awful—although they often are, covered in blood and full of horror—but because they defy and mock the idea that our choices define who we are. You’re everyone you could be, the game argues, and it makes those potential selves as awful as it can. ZTD’s setup is similar to its predecessors, Nine Hours, Nine Persons, Nine Doors and Virtue’s Last Reward. Nine people are kidnapped by a masked figure calling themselves Zero, whisked to a locked location, and placed into a series of elaborate, Saw-esque death traps. The game switches between escape rooms, like you might find on a Flash-game website, and cinematic sequences punctuated by player choices. Those choices—codified by the current Zero as “The Decision Game”—are the crux of the narrative, presenting both players and characters with chances to establish their priorities. Will you kill others to save yourself? How many? Will you trust your friends? Will you take an action that might kill one of them, if it meant saving another who’ll almost certainly die? In an even darker twist, this disconnection is clearly intentional and these murderous routes mandatory. They’re as valid as those in which things go “right.” All three games feature moments in which psychically gifted protagonists must use information gleaned from doomed timelines to do the seemingly impossible. In the past, these “bad endings” have been treated as pruned branches on the tree of possibility, to be harvested for clues and then discarded. But Zero Time Dilemma is less existentially forgiving. Invoking a brutal, bloody take on the Many Worlds interpretation of quantum mechanics—one of several topics the game’s characters will lecture each other on at the drop of a hat (or severed head)—ZTD holds that all possible futures are equally real, regardless of whether your favorite characters start chasing each other with chainsaws in them or not. And all of them, every grisly branch of the tree, have to be traversed for the game’s “true ending” to be discovered. This is intentionally cruel from the characters’ point of view, in so far as it makes their sacrifices and moral growth functionally meaningless (because there’s another version of them, one timeline over, that did nothing of the sort). For a game that’s all about emphasizing the unimportance of what we decide and the overwhelming triumph of fate, it’s deftly done. But Zero Time Dilemma’s nihilistic viewpoint is also cruel for the player, reminding us that our choices are irrelevant in the face of those the game’s developers made while designing it. 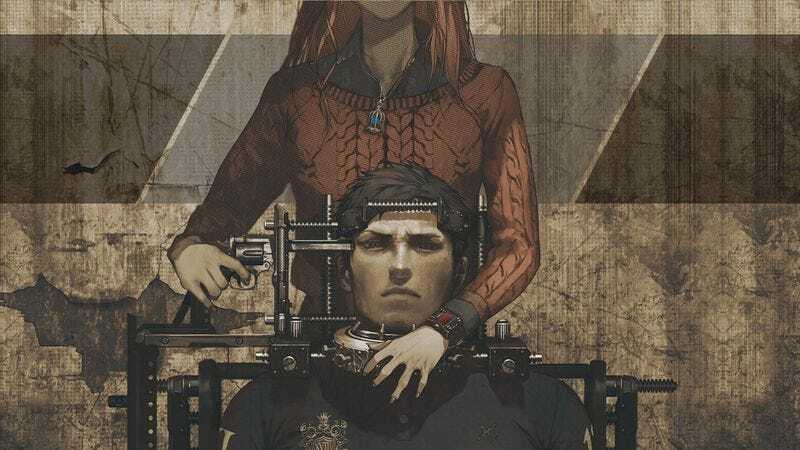 Even if Zero Time Dilemma didn’t make rewinding the clock both simple and required, those designer choices would serve to contain and limit the ones the player can make, as they do in every game. Is heroic firefighter Carlos a potential killer? It’s not up to you. Even if you were allowed to completely avoid the timelines in which he might become one, they’d still be lurking out there in the wider field of the “true” stories encoded within the game. In some ways, Zero Time Dilemma serves as the antithesis of a game like Undertale, which does everything in its power to make the player’s choices feel both permanent and meaningful. “But what’s the point?” ZTD argues, when its designers (and players) know that our curiosity will never let us see just one “path” through a game. How many of us have gone back to a decision point like the Virmire choice in Mass Effect or the big moral choices in The Witcher games, to see all the ways they could possibly play out? Even for Undertale, which actively taunts players for this tendency to reset and replay, YouTube’s always there, allowing us to see the shape of the entire narrative, not just the one highlighted on a single path. That’s the true bleakness of Zero Time Dilemma: It turns our insatiable need to see everything, to wring every possible drop of “content” out of a game, into a codified, mandatory part of the game. It colors outside the lines, bleeding its deterministic poison into choices that exist far outside itself.